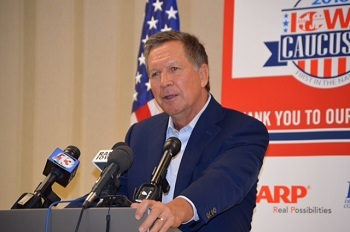 DES MOINES, June 24, 2015 - Ohio Governor John Kasich made it clear Wednesday that he does not like subsidies, particularly anything supporting ethanol. Kasich, who won re-election last fall and has not yet announced his candidacy for the presidency, was in Iowa to test the waters. He spoke at the 2016 Iowa Caucus Consortium, a partnership of the Greater Des Moines Convention and Visitors Bureau, Iowa Economic Development Authority, Iowa Department of Cultural Affairs, The Des Moines Register and Drake University. The Consortium has offered the opportunity to all presidential candidates to speak at a forum during the coming months. Kasich was the first to accept the invitation. Answering the question on ethanol in the press conference was his only reference to agriculture in a state where over 90 percent of the land base is devoted to farming. Later, in a 45-minute forum attended by around 150 supporters, Kasich touted his accomplishments in the U.S. House of Representatives (1983-2001), including his work as chairman of the Budget Committee developing the plan that balanced the federal budget for the first time since man walked on the moon. He spoke of his accomplishments as governor of Ohio including eliminating an $8 billion budget shortfall – the largest in state history – without raising taxes. He said his vision for America includes giving power back to local communities, getting the federal budget under control, growing the economy and keeping America safe. On immigration – one of the hot button topics in this election cycle -- Kasich said undocumented immigrants should be required to register and possibly pay a penalty. Kasich said he “felt the call” to run for governor after being in the private sector for about 10 years. He didn’t say if he felt the call to run for president, but did say he has is working on his message, that he’s optimistic, and that he will make the decision about whether to run in the not-too-distant future. “I won’t run unless I think I can win,” he emphasized.